I put the information for Charles and Dinah's other children apart from my Gt Grandfather Thomas William on the page for information as I thought that it would be possible that their descendants could find the site and may have further information. As it has transpired, I was contacted by John Dowding from New Zealand who is the Gt Grandson of Albert Edwin Dowding (and my third cousin) who has kindly sent me the information below. We have a common ancestor in Charles Dowding. We are descended from Albert Edwin, Charles and Dinah's third son. On your website you note that Albert Edwin's son Albert Edward was accidentally killed in 1919, aged 26. I'm not sure whether you've followed that line further, but before Albert Edward (my grandfather) died, he had married my grandmother Gladys BELL (b 20 Apr 1890 d 28 Nov 1980. They were married near Taunton, but as yet I don't have exact location or date (but probably 1915 or 1916). They moved immediately to Weston super Mare. Albert Edward was an accountant in Bristol and commuted by train from Weston each day. They had two sons. The first was Hector Macdonald (Mac) b 23 Mar 1917 at Weston. Albert was killed in a motorcycle accident in March 1919, when my grandmother was pregnant with her second son, my father. He was born 14 Oct 1919 at Patchway, where "Gran" Dowding (presumably Comfort Elizabeth) was the district nurse, and named Albert Edward after his father. 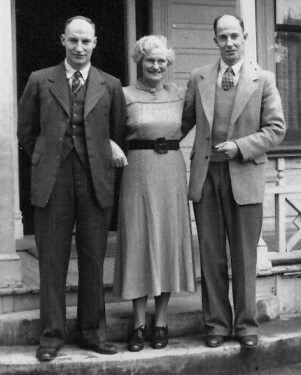 In 1926, Gladys brought the two boys out to New Zealand, mainly because her brother Frank BELL had come out nearly ten years earlier; he had established a successful baking business in Auckland and was doing very well. My uncle Mac died in 1999 and is survived by three children; I'm an only child. There are a couple of other Dowding families in New Zealand, but I don't think we're closely related to any of them. Three photos are attached. The first is of me (John Edward, b 1948) and my son (Stewart Edward, b 1993), taken about a year ago. The second is of my father, his mother and his brother; from the left my father Albert Edward (b 1919, known as Ed all his life), his mother Gladys (nee Bell, 1890-1980) and his brother Mac (Hector Macdonald, 1917-1999). This was taken in Auckland in the late 1940s I think, but could have been as late as 1952 - I'll check with my father. The third is one of my grandmother's wedding photos, taken on 02 March 1916. The groom was my grandfather Albert Edward Dowding - he was the one who died after a motorcycle accident in 1919. 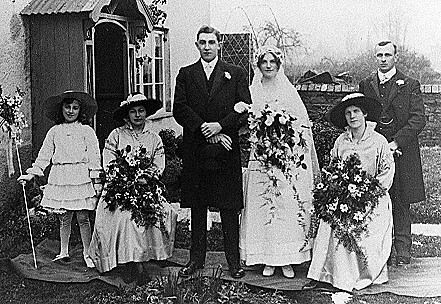 The man standing to the right was his friend and business partner H Humphries, the seated bridesmaids were (left) her best friend Dolly Crease (who later married her brother Frank Bell) and (right) my grandmother's older sister Daisy Bell, who never married (after her fiance was killed in WW1). Both Dolly and Daisy also ended up in New Zealand sharing a house with my grandmother for many years, and I knew them well. The little girl at left was Nina James, my grandmother's niece, and I met her several times when I was in England. Barton Regis certainly fits well for Mary Ann - she was recorded in Clifton in the 1881 census. By cross-matching with male Pullins of a suitable age present in the Bristol area in 1891, I had also listed Josiah as a good candidate. Will be interesting to see which of them it was. However, the marriage record in Sep-Dec 1885 does suggest we're definitely on her trail. The other interesting one is the eldest sibling in Charles and Dinah's family, John. I note that on your website you say "no information found yet". That has probably changed by now, but I've been tracking a John Dowding who seems possible. Hopefully you'll be able to say whether or not it is him. Info mostly from the censuses, and in the attached Word file. If it is him, he was a fireman in the Severn Tunnel, boarding in Monmouth, in 1881; his name is misspelt there, but age and birthplace look right. He then stays in Monmouth, marries a Catherine (in Thornbury, no surname yet), has a daughter Annie/Alice, and is a publican in Caldicot by 1901. And while I was at freebmd, I checked on a couple of other things. was in Barton Regis, Dec 1882 quarter. 2. My great-grandfather Albert's marriage to Comfort Thompson - didn't have a date for that either. A couple more things that have come to light. 1. You may remember I mentioned an "Aunty Mickey" known to my father when he was a boy in Patchway. He was adamant that she was his real aunt - his father's elder sister - but at that stage I was telling him that Albert and Comfort only had two children. He remembered she had married one Percy POPE, but couldn't remember whether her maiden name was Dowding, or what her real Christian name was. Well, he was tidying up some papers a few days ago and found one in his brother Mac's writing that showed that Aunty Mickey was in fact Beatrice Dowding. Armed with that, I found her easily enough. Then I can't find her in 1901. She would have been 10 and so presumably still at home. My father also remembered that she was postmistress at St Lukes, Bedminster. In fact when my grandfather Albert Edward got married (at Bathpool, Somerset in 1916), the marriage certificate (recently unearthed here) shows he gave his address as St Lukes Post Office, Bedminster, Bristol. That certificate incidentally shows his father Albert Edwin's profession as 'Mechanical Engineer' - a small snippet we didn't know. Mickey and Percy had two children that my father knows of. The first was Colin, b 1914 (who my father describes as a bit of a tearaway!) and Patricia, b c 1930. So it appears that Albert Edwin and Comfort had three children (Beatrice Lavinia, Priscilla Dinah and Albert Edward, in that order), rather than the two we all thought. So she could be the Catherine that appears in Caldicot in 1891 and 1901. It's all a bit tenuous, I know - just a working hypothesis at present - so evidence for or against most welcome. Possible I suppose that the third marriage in 1903 is him yet again, but I haven't found any evidence so far of a Catherine Dowding dying between 1887 and 1903.